A lot of people think of traction cleats as something meant for climbing. That is true to some degree as they are most often bought by outgoing people that do intend to do some climbing but that is not their only use. 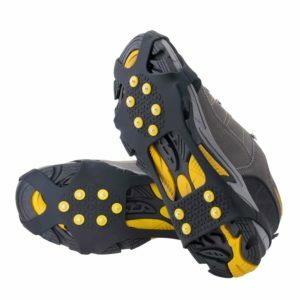 Even if they are not a common sight, traction cleats can be used in pretty much any situation that involves walking on ice, slippery soil or just climbing. For all these situations we have different models. There are different types of spikes and designs of the cleats depending on their designated use. Usually, traction cleats come as a simple frame that is applied over the show. There are multiple types of traction cleats and some designs are better than others. The most widely spread type is the traditional rubber frame with a coil wrapped around. They work well but the ones that have spikes instead of coils work much better. Another type of cleats that work well on ice have a nylon strap attacked to a plate with steel studs. Also there are some that look similar to tire chains but applied onto shoes. The most affordable models come in the form of simple rubber bands that have metal studs. For our list we focused more on safety rather than saving money. A good mix of affordable and reliable traction cleats managed to get into our top 10. We will leave out the cheap bands with buds and we avoided the nylon straps. We ended up with a decent selection of cleats that make it much safer to climb or walk on ice and snow. To keep things short, let’s start with our least popular model, the number 10 and work our way down from there. Here are the top 10 best traction cleats for snow and ice in 2019. This multi-directional cleats will enable you to make natural strides with ease while allowing you to have a greater traction on snow or ice covered pavement. With its tension fit system, you can securely keep your shoe on your feet. Moreover, they are engineered to stretch in order to fit in your shoes perfectly. It is made from lightweight materials that are flexible and easy to fit and stick on your shoe or boots. Its aggressive treads prevent you against slips and frequent falls on slippery ice. 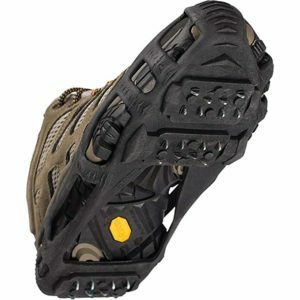 These YakTrax cleats feature great traction that allows you to walk, jog, and hike safely. It is made from high abrasive and heavy-duty rubber that securely fits onto shoes with long lasting straps. It also provides 360 degrees of traction even on very slippery surfaces for stability in all directions. The long lasting rubber foot frame with removable over-foot strap securely holds on your shoes. You can wear it in temperatures that are as low as -41 degrees F.
Yaktrax Walk Traction Cleats are affordable and lightweight with a slip-on traction that lessens the risk of falling when walking on ice and snow. They feature abrasion-resistance steel coils coated with zinc to guard against rust. They are secured to shoes with a long lasting polyestomer outer band. Its elastic outer band comes with hell tap slips that enable easy slip on and off. These are ideal cleats for pedestrians, elderly persons, and professionals. With 360 degrees of traction, you will be sure to have adequate stability. STABILicers Maxx cleat is versatile and best-in-class for providing great traction even on slippery surfaces while going about your outdoor activity. This cleat is designed for high-performance and stability as you walk on ice and snow. You can easily wear to perfectly fit with adjustable SureFit polyester hook-and-loop bindings that hold even under wet circumstances. It also features a full-sole coverage that enables you to have a natural stride. Kahtoola MICROspike cleats feature pocket-sized traction system that allows anybody to have a safe walk, jog, or hike during the winter season. They come with slip-on spikes for digging deep into any slippery terrain such as wet rocks, ice, and scree. This will enhance your safety and allow you to explore more. The cleats are also made from high-quality materials, thus making them long lasting. Moreover, they are capable of fitting perfectly on your shoes or boots without any special straps. These cleats from ICETrekkers feature diamond grips that offer maximum traction for stability in all winter walking and hiking conditions. They are made from a casehardened steel alloy with a strung on steel aircraft cable for gripping your footwear in all directions. The diamond grips also allow you to walk through mud, rock, ice, gravel, and snow. They are easy to wear and take off owing to their elastic but tough rubber sling. Additionally, they are versatile cleats that can fit on almost all kinds of footwear. Moreover, you have fewer worries about cleaning them since they are self-cleaning and capable of preventing ice and snow from accumulating. OutStar Ice and Snow Grips Over Shoe are made to fit both men and women while preventing them from slipping on ice or snow surfaces. They are made from thermoplastic elastomer and special non-slip steel studs for maximum traction and stability. These materials make them lightweight yet durable. 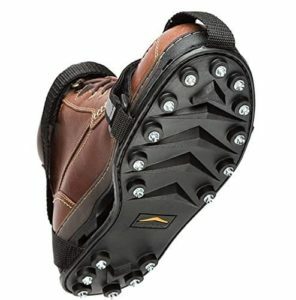 Moreover, they come with special ground-gripping steel studs that offer great traction on snow and ice surfaces. Their featherweight construction enables them to fold up and fit your pocket. Moreover, they are easy to put on and take off. As a result, they are great cleats for ice fishing, jogging, snow shoveling, and other outdoor activities that involve walking or jogging on snow or ice. These cleats are designed for runners who want continuous training even in winter snow and ice surfaces. They feature a strong rubber foot frame that is equipped with straps for extra security. Moreover, their heel and side straps secure the cleats safely to your shoes. They also feature multiple coil angles that offer 360 degrees of traction on ice and snow surfaces. The carbide-steel spikes and the shagged-edge coil combine with the rust-resistant stainless steel to offer the required stability on slippery surfaces. Hillsound Trail Crampon Traction cleats are ergonomically designed to offer a perfect grip on your footwear. It’s easy to put on and take off. They are lightweight, which makes it easy to walk on ice and snow with the confidence provided from the superior traction and stability. What’s more, they feature hinged plates that stretch to fit with the sole of the boot. These are high-quality anti-slip cleats that securely cover over the shoes to offer great traction and stability. They feature rust-resistant spikes that provide unmatched grip on slippery surfaces enabling you to have an easier walk without falling. This makes them great anti-slip cleats for your footwear. Not all the models in our list will perform well when used for hiking or climbing. Some models are made just for walking. Before rushing to hit the buy button it is important to check what the cleats are for. In our list we included models that can be used for various purposes and for most part they are all in the same price range. Another thing to keep in mind is that there are multiple traction cleat designs. As described in the beginning some of them are better than others. For regular walking, the ones with coils around rubber straps are a great option as they are self-cleaning and do not have snow sticking to them. 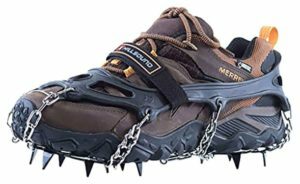 The models using chains and spikes are a bit more reliable and work great for hikers and climbers but they tend to break easier. I have been using, as most of my 120 people running and hiking club Icespike. Disappointed they are not represented. Traction cleats are mandatory for all outgoing people that like hiking and climbing on icy mountains. They are usually made to be used over a pair of shoes and due to their build they tend to fit any size. Most of them come with spikes that can perforate ice and thus provide improved grip, prevent accidents and eliminate slipping. Their pricing can vary a lot but for most part they tend to be affordable. There are hundreds of traction cleats available and for our top 10 we had to choose only a handful. Here are the top 10 best traction cleats for snow and ice in 2017. Foxnovo Ice Traction spikes are probably the most affordable model in our list. They are made out of thermoplastic elastomer that make them both durable and can withstand extremely low temperatures. They are fairly easy to put on and come with 10 spikes distributed on the heel and front side to provide uniform stability and grip. The model is available in multiple sizes and two colors to choose from. 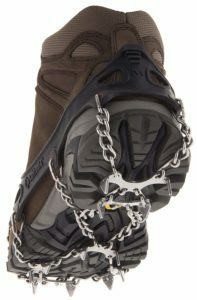 The ICETrekkers shoe chains have a sturdy build made out of metal making them extremely resilient. It comes with a rubber sling attachment system that make them fit most types of footwear while preventing the traction cleats from slipping off. They have welded links made of hardened steel but they do not come with sharp spikes recommending them for walking on snow rather than climbing on ice. The Campleader Crampon 2015 come with several improvements that make them better than previous models. They now feature large spikes made of hardened steel that can also withstand extreme low temperature. Their upper side is made of thermoplastic make them easy to install. 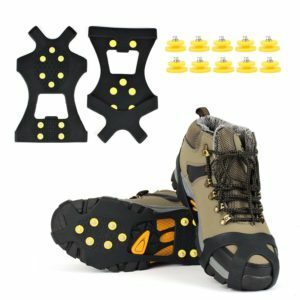 Due to the design of the model the cleats can be used for multiple types of activities including walking on ice, hiking, ice fishing and many others. Kahtoola MICROspikes fall into the premium category not only due to the higher price but also due to their design and build quality. 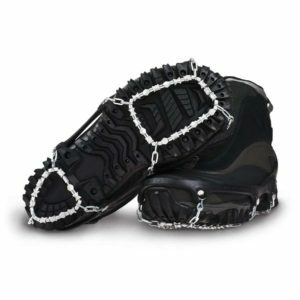 The model features durable steel chains and spikes as well as a rubber fitting that makes them usable with most types of boots. They can withstand low temperature and can provide excellent grip even when hiking icy mountains and trails. The model includes special straps and laces that secure it in order to avoid any kind of slips. 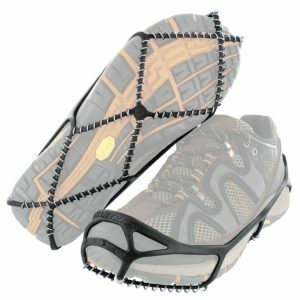 Hillsound Trail Crampon traction cleats are popular mostly for their simple design that makes the model both discreet and reliable. It has chains and spikes made of hardened steel and a durable harness with Velcro straps that secure the cleats to most types of shoes. They can witstand an average pressure of 2 metric tone which translates into about 400 pounds. It is fairly affordable and comes in six different sizes and two colors to choose from. ICETrekkers Shoe Diamond Grip are excellent for beginners. They are fairly affordable and well built. The model is perfectly suited to be used for hiking and walking on show. Its rubber sling does not slip off and due to its flexible nature it can fit most shoe types. It has small spikes and chains made of durable steel that prevent corrosion and are durable enough to break ice and provide superior grip. The Glacier Chains GSC shoe cleats were made for experienced climbers despite being affordable and easy to put on. They have a durable elastic rubber that keeps it from slipping and solid steel spikes that can break through ice. The model is mostly recommended for snow operators, hiking, fishing and other activities that involve walking on snow or ice. 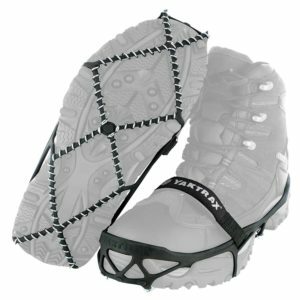 Yaktrax Walker cleats are excellent for walking on ice and snow. They might not work as well from climbing or hiking but they work great for almost anything else. The model is flexible and durable which makes it adjust to most footwear. It has steel coils that go beneath the foot thus preventing any kind of slipping on ice or snow. The model is notably light and easy to put on or take off. The Hillsound Trail Pro crampon traction cleats were designed to be used in extreme weather conditions. In fact they were tested in the Himalayas which proves that they can be used on snow, ice and for climbing. The model has steel spikes and advanced anti-balling pads that prevent snow from building up beneath the foot. Their design makes them relatively easy to install and can fit most types of shoes. What makes the Stabilicers heavy duty traction cleats so popular is their simple design. The cleats have a plastic base that covers the entire show. 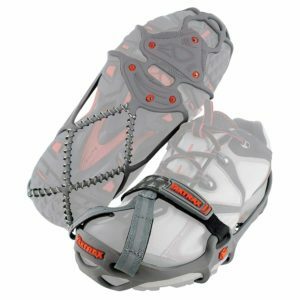 Stability and traction is provided by 34 replaceable steel cleats while the Velcro straps help it remain secure regardless of the type of shoe they are installed on. Their design makes them extremely light while the price recommends them to anyone regardless of the available budget. Traction cleats for ice and snow can be different from one model to another. The ones that do not use long spikes tend to be more comfortable to wear but they are not suitable for nature outbreaks. 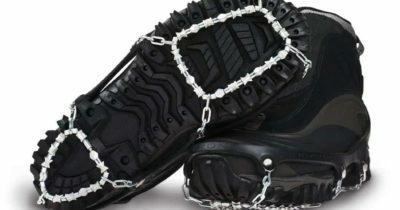 For activities such as just walking on snow or ice the chain models are better suited. Our top 10 includes a wide selection of traction cleats for ice and snow from all categories and for all budgets. I’ve had the Yaktrax for over a year and they are awful. This review must be biased. Have the reviewers tried them? They do not provide and grip on ice, in fact they are slippery. Im looking for something that will have very durable hard steel picks to pierce the ice, but last a long time. Help!